I was excited when Cold Steel announced the Pro-Lite. I like good knives, and I like cheap knives, and the Pro-Lite looked like it might check both boxes. And while there’s definitely a lot to say about Cold Steel’s behavior in the last few years, it’s nice to see a genuinely interesting budget knife from a company other than Kershaw. People talk about the Hinderer/KAI collaborations a lot but, really, the partnership between Cold Steel and Demko is where it’s at. Cold Steel’s affordability, competent machining, and quality materials complement the utility-driven Demko style perfectly. This harmonious pairing has allowed Cold Steel to first reinvent itself as a maker of reliable tools and not just oversized Mall Ninja props, and to move upmarket with compelling offerings in the mid-priced knife bracket. That move meant there wasn’t really an entry-level Cold Steel knife anymore. Sure, there were a few cheap knives in the lineup, but they were all a little too corner case or niche to be representative of the brand. With the Pro-Lite, Cold Steel brings out a true modern CS design, at a low price. This is the Cold Steel budget flagship we were waiting for. The Pro-Lite has a blade length of 3 5/16”, a handle length of 4 ½”, and an overall length of almost exactly 8”. It is very light for its size, weighing only 3.2 oz, and is made in Taiwan. Andrew Demko’s style is particularly adaptable to production knives. I think this is because his design philosophy is so practical. His blades are stylish, but that style derives from a commitment to utility. Every custom maker I’ve ever spoken to says they want their knives to be used, but few make this as obvious as Demko does. It also helps that his signature design element, the Tri-Ad Lock, is easy to implement in production knives. Generally, I prefer smaller knives. I’ve been trying to carry more larger knives to get a feel for the advantages they offer. For what it’s worth, I think the Pro-Lite’s size is part of its charm. This wouldn’t work as a smaller knife. The incredible ergonomics would be compromised, and the very nice blade shape would be altered, likely for the worse. My Pro-Lite has a clip point blade, long and low-slung, similar to the Buck 110’s blade. I think I’m still a drop point boy at heart, but the clip point is growing on me. The Pro-Lite’s tip is just south of the pivot, and the blade is ground thin enough that you get a lot of a control. The hollow grind starts fairly low, but given the thinnish initial stock you have a good combination of sliciness and stability. This is a burly blade I can get behind. Steel is interesting. As much as I would have loved to see Cold Steel’s erstwhile standby, AUS-8A, on the Pro-Lite, what we have instead is Krupps 4116. A less common steel, seen on a few of Cold Steel’s previous super-budget options like the Pocket Bushman. I’ve never had a knife with 4116 before, and my experience with it on the Pro-Lite has left me ambivalent. Edge retention seems to be below AUS-8A, and while it is rust-resistant, it has a splotchy finish that just looks weird. Even in the glamour pics on retail sites it looks bad. In the end though 4116 is serviceable and easy to sharpen, which is tantamount in an ‘everyman’ blade, as the Pro-Lite is designed to be. Word on the street is that Andrew Demko was particularly fond of the Pro-Lite’s handle, and he has every reason to be. The ergos here are excellent. The bi-level sculpting puts your fore- and middle finger at a lower level than your ring finger and pinky, letting you pinch around the pivot for superlative control. The guard is pronounced enough to keep your hand from going forward, but shallow enough not to interfere with cutting. The beak at the back keeps your rear two fingers situated. This is one of the nimblest-feeling medium-sized blades I’ve ever handled. Other nice things: there is a slight contour to the scales. The orange peel finish is positive-feeling, but not Cold Steel Classic abrasive. The extra-large jimping on the spine of the knife is great for indexing. Overall proportions for a medium-sized knife are spot on. The Pro-Lite feels hardy and dependable without feeling comically overbuilt, and it has a rugged, Jean Claude Van Dammian swagger that some of the more cerebral heavy-duty knives lack. The Pro-Lite is a little wide in the pocket, but it’s nothing catastrophic. At its widest point it’s still narrower than a PM2, and it’s nice and thin compared to something like a Voyager. I also heartily approve of the clip. Angled clips are one of my pet peeves, and I’m hoping that Cold Steel is moving towards straight, unadorned clips like this one in the future. Tension is perfect, length is just right, and it seems durable. I have no complaints here. It may not be a revelation in the pocket as it was in the hand, but the Pro-Lite still carries damn good. Cold Steel cheaped out big time on the washers: big plastic affairs. The pivot feels cottony, and deployment is very slow. A lockback isn’t ever going to be the fastest opener in the world, but these cheap washers really gunk it up. Once the knife is broken in they’re serviceable, and I can just about flick it open now, but really, phosphor bronze washers would be perfect here, and even at $30 that isn’t asking for the moon. The Tri-Ad lock is here, and completely serviceable. I get the slightest amount of vertical play if I really wrench on the Pro-Lite, but it’s nothing to get upset about. For a working knife, the Tri-Ad lock is such a good choice. It’s dead simple to operate, requires no real maintenance, and is as unfinicky as they come. Worth noting, however, is that there are degrees of quality in Tri-Ad locks. This is a workmanlike variation, less tuned than the one on my Large Espada. If I flick open the Pro-Lite really hard the lockbar travels deeper into the notch on the tang and it takes some doing to unstick it. It doesn’t feel as dialed in as on a higher-end offering, but I don’t think it affects performance in the least. The Pro-Lite makes a lot of sense for Cold Steel 2016: when most of their line was in the $40-60 range, they would undercut themselves with something like this. Now that they’ve moved upmarket, they can introduce a blade for somebody interested in their design ethos and the Tri-Ad lock, but without the money to spend on higher-end options. And, in the budget knife world, I think the Pro-Lite can compete with the all-time greats in the price bracket: the Drifter, the Tenacious, the Cryo. If they made a Pro-Lite with contoured G-10 scales, CTS-XHP steel, and tighter fit and finish, I would gladly pay $120 for it. And you can’t always say that you’d be interested in higher-end versions of budget knives. A Drifter wouldn’t be all that interesting against more the diverse competition in the high-end market. It’s too generic. The Tenacious fails to impress next to the Native 5, or even the Delica. But I like the Pro-Lite design better than the Voyager or the Recon 1. There is no dearth of cheap knives in the world, but there are precious few that we will remember in five years. There are budget knives that are good budget knives, and budget knives that are good knives. The Pro-Lite falls into this second, much smaller category. This is a great design, full stop. It is quite an accomplishment, and even amongst the string of great knives Cold Steel has been releasing, it stands out. Its own flaws can’t stop the design from shining through either. For $30 this is an easy, easy recommendation. 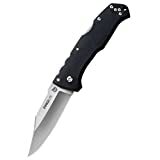 Editor’s Note: I recommend purchasing the Cold Steel Pro Lite at Amazon or BladeHQ. Please consider that by purchasing things through any of the links on this website you support BladeReviews.com, keep the website free of annoying banner ads, and help produce future reviews. Thank you very much. I recieved the tanto version of the Pro Lite last week and initial impressions were mostly positive but i’ll admit the fit/finish left a bit to desire.I keep reminding myself this is a budget folder and to keep expectations in check but i can’t help but to dislike the frn handle scales used.To me they feel cheap and also look cheap in person.I agree opening action is slow and sluggish and CS should have used better washers,but that doesn’t bother me nearly as much as the frn scales do.The 4116 steel is ok,nothing special,but i do like using it for fishing/hunting,and food prep as it has excellent rust resistance,and takes a very keen edge fast and easy,and seems to hold a fairly decent edge cutting meats and vegetables,but it doesn’t do nearly as well when cutting materials such as paper and cardboard.Overall i feel as though the Pro Lite is a solid folder at a price that’s consistent with the materials used,but i wish CS would have put a little more thought and effort into it and produced it with G10 or even Griv-Ex scales,better washers and Aus8 steel,even if it meant raising the price $10-15,it would have been well worth it in my opinion and would have turned a good budget folder,into a great budget folder. I get why you wouldn’t like the FRN scales. They didn’t bother me, and I feel like they will hold up just fine under any reasonable use but they are far from luxurious. 100% agree on the cost. Consistent with what we get, but it certainly doesn’t give as any more than what we might expect – which I think the best budget knives always do, and which might keep the Pro-Lite from reaching the very peak of the budget knife pantheon for me. Maybe Cold Steel is testing the waters, seeing how people respond to the blade before investing in it further. I too care about cheap knives, and I like seeing them reviewed, so this was a good read. There is a ton of common DNA between the Pro-Lite and a knife I know well, the $25 Cold Steel Tuff Lite (full sized – the Mini TL is cute but very limited IMO). The Pro-Lite’s handle construction, handle texture, lock button, and pocket clip all appear to come directly from the Tuff Lite. Ben writes that the existing cheap CS knives are all “corner case or niche” items, and that’s a fair description of the Tuff Lite, a stout little 2.5″ straight wharncliffe with a thumb oval opener, a crazily ergonomic handle, the Tri-Ad lock, and an aggressive hollow grind. The TL is a glaring exception to my “no more than one choil” rule. Its two-choil design melts into your grip, whether held forward or reverse. It’s like having a talon pop out of your hand, like the little cutter becomes part of your skeletal structure. Amazing cutting power on thick cardboard, packages, ropes and the like. It is a bit awkward (but still workable) for other common EDC tasks like food prep. I typically get a strong yen for the Tuff Lite, carry it for a week or so, and then drift back to something with a more conventional blade shape. The Tuff Lite family is also just about the only offering left in CS’s stable with their stalwart AUS-8 blade steel. From the review here, steel seems like a big advantage of the TL compared to the Pro-Lite’s Krupp alloy. The Tuff Lite has no washers! The blade just pivots on smooth synthetic. It’s actually a nice feeling deployment. No question that the Pro-Lite’s shape indicates a much more versatile, generalist edged tool. But the Tuff Lite has a lot of personality, and it has earned a devoted niche fan base. You make a good point, the T.L. may be the exception there. I have a Mini Tuff Lite and it continues to be a favorite. It’s currently playing the role of my dedicated backpack knife. The Tuff-Lite has been on my list for a long time. I don’t know may people who own one and don’t like it. I didn’t notice the family resemblance but you’re absolutely right. I would say that the new Pro-Lite resembles the TL more than it does the old Pro-Lite. I can live with the double finger choil – I’m usually okay with two if one is on the blade, but the blade shape is always what held me back. Your report seems to confirm my hypothesis: that the TL would be amazing at certain things and kind of weird at everything else. You know, I’m definitely starting to miss AUS-8 in Cold Steel’s lineup. I’m sure XHP is worth the upgrade, but I still think AUS-8 dominates value steels. Krupp is comparatively bland and sub-par. I would take no washers over what we have here. I still love the Pro-Lite but man does the pokey deployment bug me. On some days I think it verges on performance-affecting, because I’ve nearly misfired the blade a couple times. I think personality is an important characteristic in cheap knives. The Tuff-Lite has it, the Pro-Lite too, and the Utilitac 2 does as well, which is why, I think, they find more pocket time than other, better-on-paper knives like the Drifter. Thanks for the comment, as always! Received my Pro-lite today. At first I got very frustrated trying to open the blade with my thumb as per video. I then decided to flick it open with a wrist action from top to bottom. It opens very smoothly in this way and very fast without a ”click” sound. Closing the blade is difficult, though. My pointer finger hurts. I wanted to buy these knives as gifts for family members. I like the knives…i bought 3！！！ But they won’t make good gifts. I will use them. Don’t understand the attention to closing, but I do have stronger hands, I guess . The strong lock is worth it. For has blade shape, like the clip, man it can pierce and slice, but, getting all three due to value/ cost ratio. With new plastic strength no need for liners for these. A great value for a 3.5 ” everyday blade. Cold Steel has some winners. We try to pay attention to everything here. If it’s not a part of the knife review you care about, fair enough, but we try to be thorough! I agree that it’s a great value. Cold Steel has a lot of great stuff in their lineup.